You’re the one doing it all. In my film review of the movie “The Hollow Child“, I started again with a plea about trailers and I summed up the reasons why I avoid them. I saw the trailer from “Upgrade” by chance at the beginning of this year. Believe me, I was ecstatic and enthusiastic. “I HAVE to see this movie“, I thought. There are trailers that look inviting and afterward, the film looks very disappointing. But “Upgrade” certainly doesn’t belong in this category. On the contrary. This is one of the best films of the year for me. An excellent SF provided with a wonderful concept and which gradually switches to a tough revenge film. For me, it was an exciting mix of “Robocop“, “John Wick” and “Demon Seed“. “Robocop” because of the cybernetic aspect. “John Wick” because of the extravagant violent part. And “Demon Seed” because of the overall moral of the whole story. A successful cocktail that results in a titillating film. STEM means voice in Flemish. Coincedance? 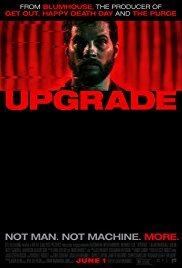 “Upgrade” tells the story of Grey Trace (Logan Marshall-Green), an old-skool-styled guy who is restoring old-fashioned Pontiacs and who’s horrified by everything that’s related to high-tech stuff. The evening Asha’s (Melanie Vallejo), his wife, fully automated design car malfunctions and crashes, they are being attacked by some violent gang. The result is a lifeless girlfriend and Gray having a shattered spine. And that’s when the millionaire Eron (Harrison Gilbertson) appears and presents his latest revolutionary chip STEM. An artificially intelligent microchip that functions as a superior brain so the paralyzed Grey can lead a normal life again. And even more. When you’re able to watch this movie with the necessary skepticism and you don’t take it too seriously, then this B-movie styled, action-packed SF is a welcome change and a way to de-stress after a hard day’s work. The story itself can’t be called groundbreaking or original. It all seemed a bit too predictable even to me. There’s only one thing I hadn’t seen coming. And that’s the final twist. What a pleasant surprise that was. The action is finger licking awesome. And when you like neatly-filmed action scenes, then you’ll enjoy this flick as well. The confrontations in “Upgrade” are such that I gladly re-watched the same scene over and over again. Not because I enjoy seeing bloody, horrible scenes. But because the choreography looks extraordinarily good and in a certain way, they managed to provide it with the necessary humor. The tilting camera. Grey’s surprised face. And the way the bad guys are killed. It all looks damn perfect. I can’t think of anything bad about the acting. Logan Marshal-Green knows amazingly well how to show different emotions. From helplessness to bewilderment and purely evil. The entire pallet of emotions is shown. And the opponents all look fearless and ruthless. Equipped with ingenious cyber-like assault weapons and futuristic deadly gadgets (even an innocent sneeze is deadly). The only thing I was annoyed about is Gray’s way of moving. Although he was told at the beginning that he wasn’t really a robot, his body moves like a purebred Robocop. But that’s the only remark I can think of. My advice is to go and see this highly entertaining cyberpunk SF as soon as you can. Just do it!